Amber and Tom hook up at a party at their elite American university and spend the night together. They agree on the drinking, they agree on the attraction, but what actually happened between them? 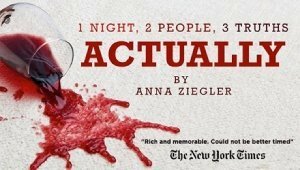 With wit and urgency, Actually investigates the highly charged topic of sexual consent, the complex intersection of race and gender politics, our crippling desire to fit in, and the three sides to every story.